I was expecting the highlight here to be a devastated reaction—or, just as fascinating, an unimpressed one—from Rebecca Lobo, one of the defining players from Geno Auriemma’s historic run at UConn. Instead I find that I can’t tear my eyes away from Kara Lawson, whose expression is utterly inscrutable, and I suppose can be read variously as pure professional stoicism, or stunned silence, or even maybe anger? Or respectful, empathetic stillness for the sake of her colleague? One way or another, she must be one hell of a poker player. There is so much to see, here. 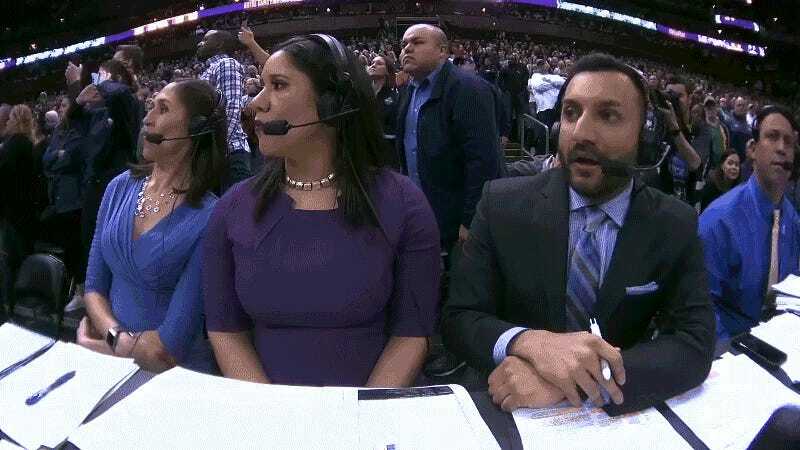 Lobo’s composed, contained disappointment; Adam Amin’s twitchy energy; Lawson mouthing “hell of a call” to Amin as he sags into her shoulder, overcome. Perhaps my favorite person in the video is the stunned, and perhaps horrified, woman standing behind Lobo, agape, struggling to process the moment. I’ve watched this thing 20 times already and I’m still chuckling at Amin popping up like a Jack-in-the-box when Ogunbowale’s shot finds home. Every sports broadcast should have one of these cameras.